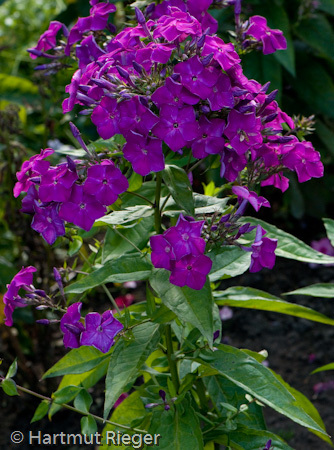 Border Phlox love rich, moist soil, but often have to put up with less than ideal conditions. In our experience they still flower well but don't get so tall. The key requirement is moisture retention, so dig in lots of compost to enrich the soil. A good thick mulch (blanket of organic material like old potting compost, bark or even grass clippings) helps keep in moisture and protect young shoots from winter frosts. A sunny position is ideal but we've found most phlox are okay in a slightly shaded site. Beautiful pictures of Phlox both in close up and in a glorious garden setting can be found on the late Hartmut Rieger's website www.helenium-phlox.de. Spring: Protect from slugs if damage is seen. This is not a big problem in our garden but each site is unique. Spring is the time split clumps and take off rooted offsets to make more plants. Use some balanced fertiliser and mulch when the soil is wet. Staking of tall varieties may be necessary (although ours never tall enough to worry about this). If you see split stems this is probably due to drying out followed by watering. If split stems are accompanied by badly distorted and whip-like leaves then your plants may have eelworm and they should be dug up and destroyed. Fortunately eelworm is pretty rare these days. Deadhead regularly. If mildew is a problem in your garden, spray with something like Roseclear from late May once a fortnight 2 or 3 times. If you need to water the plants try to water at their bases and not on the leaves to reduce chances of mildew. Enjoy the great fragrance of the flowers particularly in the evening! Other rarely found problems include Caspid Bug damage - lots of blackened tiny holes in the leaves at the top of the plant: spray or ignore. Look out for "reverted" stems on variegated plants and remove them right at the roots if possible. Some phlox with striped flowers (e.g. Peppermint Twist) can revert and produce plain pink flowers. This may be due to the fact that just about everyone of these comes from micro-propagated stock - time will tell. Take cuttings of healthy phlox and root in gritty compost. Keep deadheading to get more flowers! You can split phlox now but you may have to pot up and protect small divisions to get them through the winter. At the start of winter cut the stems right down to the ground and clear up as much of the fallen leaves as possible and don't put this waste on the compost heap - dispose of it in your green waste bin or burn. This reduces risk of eelworm and mildew for next year. If your garden gets penetrating frosts, mulch around the rootstock to protect it. 1. All Phlox are pink to some extent. When growers describe Phlox as "Red" or "Blue" these colours have a big lump of pink in them and they can sit clashingly with red or true blue. Interesting or glaring depending on your personal taste. 3. Phlox perform best where they have plenty of air circulation around them, so don't crowd them in. Division - dig up in early spring and break or chop into sections each with roots. Plant out straight away. Division can be done in autumn but pot up and protect small divisions. Irishman's cuttings - separate off rooted offsets in spring. Pot up or plant out. Soft cuttings - take tip cuttings in early summer as very young plants are difficult to keep through winter. Root cuttings - take 2in root cuttings in winter. These can take 2 years to form flowering plants. Loaded with flower July and August. Fragrant. Price £6.00 (9cm pot) Only a few this year. This is one of the best "blues" which is at its best early in the day. Moreover is has a good fragrance. In the spring the fresh shoots are flushed with red and purple. It grows to about 2ft 6in tall in our garden but said to be a bit taller in very good soil. Flowers from early July until late September if dead headed. Border Gem is fine old English variety introduced by Fairbarn in 1913 with rich deep purple flowers on sturdy, 2ft 3in tall plants from late June. This old variety from around 1940 has superb showy vivid pink-red flowers with a striking magenta eye as well as a good fragrance. It grows to about 2ft 6in tall and flowers from late July. 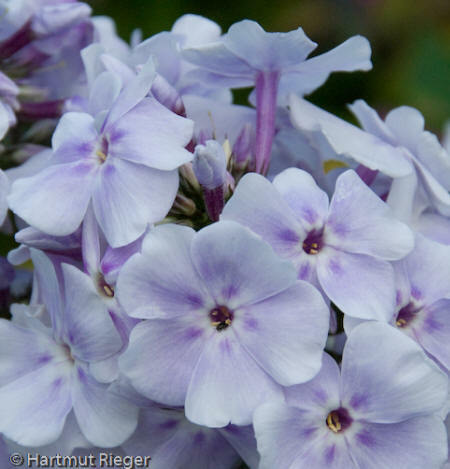 This is a woodland phlox with as the name suggests masses of fragrance to powder blue flowers in spring. It needs a shady setting and lots of leaf mold making an acid or neutral soil. About 9-12" tall in flower and forming a mat of ground-covering leaves. David is a newly introduced white Phlox that blooms from early July. It is about 3ft tall in my garden and has a slight fragrance. Flowering from mid July. Its leaves a light green and healthy. The petals are white but the flower tube is pink giving the suggestion of a pink eye in bright sun. Discovery has lovely flowers. In bright sun they are pale pink with rose eye. In dull weather the pink is very pale, nearly white. It is fairly tall (4ft) and is very fragrant. It flowers from early July and has a particularly long flowering period for us. Old variety with plenty of perfume. Medium tall. Late flowering. She puts a great show just as other phlox are starting to go over. We grow her in the most exposed part of our garden and her shout stems stand up to the summer gales we seem to get nowadays. This Phlox was one of the stars of the recent RHS trials with its masses or extra large flowers. 3ft tall. Franz Schubert has very large flowers in a refined shade of pale violet. He has a good fragrance, starts flowering in mid July and grows to about 3ft tall. This variety was bred and introduced by Alan Bloom and named after his favourite composer. Old variety with red-eyed white flowers. About 2ft tall. Lovely lilac and white. About 3ft tall and flowering from late June. 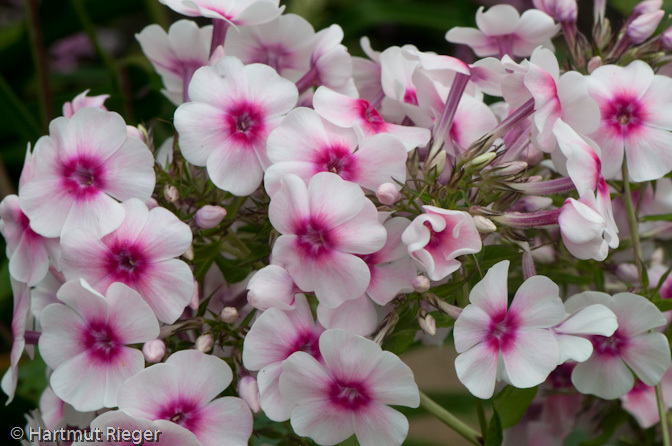 This new Phlox has lovely pale pink flowers with a white eye and edge on 2ft 3in ft plants. She blooms for a very long time (mid Jul - Oct) and does well even in a partly shaded spot. The flowers have a particularly good fragrance. A lovely reintroduction to the UK, this Phlox has very large heads of white flowers speckled with pink on 3ft tall plants from late July onwards into autumn. Fragrant. The amount of speckling does vary with the weather and appears most prominent in warm, sunny conditions and less (or even absent) in cool, dull conditions. (See photo below for cool weather colour). The name of course means "Crystal Mountain". This is one of the best pure white flowered varieties. Although the pips (florets) are small, they are held on large, impressive trusses and they are very Fragrant. It is late flowering and tall: about 4ft. This is one of the most healthy and tolerant of Phlox. It is also called Fujiyama in some books. Really good dark wine red. About 3ft tall and flowering late June to early August. One of our most popular and asked for Phlox. Othello is pictured in our garden with Veronicastrum Lavender Tower. Othello has masses of small deep claret pips and some fragrance. The leaves are purple flushed in spring. He gets quite tall, growing to 3ft tall. He starts flowering in July and is still blooming in October. Starfire is one of the best loved Phlox with its deep red stems and red-flushed leaves topped by deep crimson flowers from mid July. It grows up to 3ft 6in. Such a delicate shade of blue and white with that starry centre. Flowers from late June and about 2ft 6in tall. Fragrant. God is in his heaven and all is well.